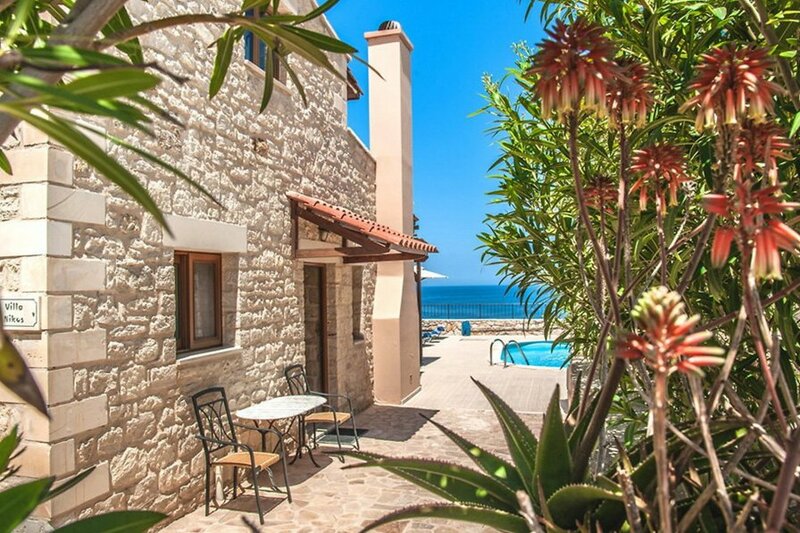 This 3-bedroom villa for up to 5 guests is located in Stavromenos and has a private swimming pool. Stavromenos 12 km from Rethymno: Very cosy villa Villa Nikos, 2 storeys, terraced, surrounded by trees. 3 houses in the residence. In a sunny position, 1 km from the beach. Private: property 150 m2 with flowers and trees, beautiful garden to relax, swimming pool with privacy (24 m2, 01.04.-31.10.). Pergola, terrace, garden furniture, barbecue. In the house: with TV, internet access, WiFi, air conditioning, washing machine. Linen change 2 times per week. Towel change 2 times per week. Parking. Shop 1 km, shopping centre 12 km, restaurant 1 km, cafe 1 km. Nearby attractions: Lake Kournas 35 km, Knossos Palace 80 km, Samaria Gorge 100 km. Please note: car recommended. Baby equipment on request. Property ref. GR6610.100.1 is situated on the same property.